Racking: Industrial and commercial racking systems for the storage of a wide range of products. From the smallest nut and bolt to the largest box or pallet we have the racking solution to all your storage problems. Racking systems for industry, commerce and home. Adjustable Pallet Racking is the most popular of Warehouse storage solutions, providing a great deal of flexibility for the safe and efficient storage of palletised goods. Pallet racking consists of two main components, the frame (or upright) and the beams. A pair of beams is needed to create a level, and two frames are needed to make a bay. To create a run of racking, a third frame can be added to make 2 bays, the middle frame then become common to the two bays either side of it. A simple way to envisage this is to imagine 5 lamp posts on a road and imagine they are the frames, between your lamp posts you will have 4 gaps (the bays) so 5 frames will create 4 bays. 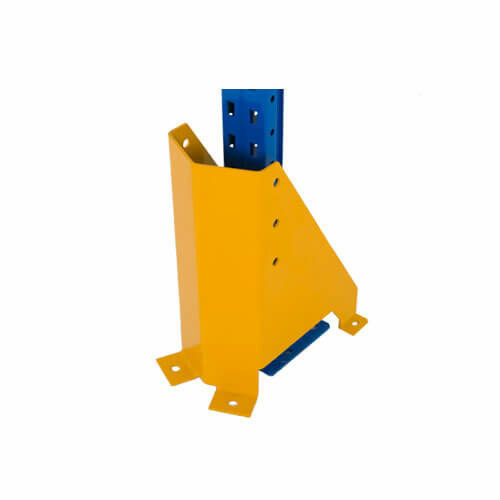 This type of racking is simple and easy to install, with the adjustable cross-beams simply slotting into place, meaning that changing the level heights can be done quickly and easily when the need arises. The range of beam lengths and frame heights available also means that all types and sizes of pallets can be accommodated with ease. With the addition of chipboard, steel shelf panels or slatted-timber decking the basic pallet racking structure can also be utilized to store non-palletised goods and create ideal spaces for order picking and stock control. No pallet racking job is too big or too small for Spectra Systems, we are happy to supply a quote for anything from a single frame to a full warehouse. We usually have stock in a range of sizes from all the leading manufacturers, including Dexion Speedlock, AR storage solutions, Apex, Link 51, Hilo, Polypal, Redirack, Stackapal, Mecalux and Planned Storage. If it's not on the website, please call us and we may be able to help you.